The commercial pilot was in the process of purchasing a block of flight time with the intent of building time toward an additional rating. According to the operator, the pilot did not complete the mandatory checkout. However, she possessed the keys to the airplane since she had flown the previous day with an instructor, but he did not approve her for solo flight because he believed she required additional practice landing the airplane with an instructor onboard. On the day of the accident, she flew an undetermined number of local, solo flights without the knowledge of the operator. The accident flight was initiated at night, presumably with the intent of operating in the local airport traffic pattern. About 7 minutes into the flight, the pilot likely encountered instrument meteorological conditions (IMC) and requested assistance from air traffic control. An air traffic controller attempted to provide the pilot with radar vectors to a nearby airport; however, the pilot was unable to visually acquire that airport. The controller then observed the airplane on radar at 600 ft and descending and directed the pilot to climb and turn. A short time later, radar and radio contact were lost; the airplane had crashed. The level of damage and fragmentation of the wreckage was consistent with ground impact at a high velocity. The flight was conducted on a dark, moonless night, under an overcast ceiling, and the final portion of the flight was over the ocean. These factors would have reduced the pilot’s ability to perceive the natural horizon and increased her risk of spatial disorientation. 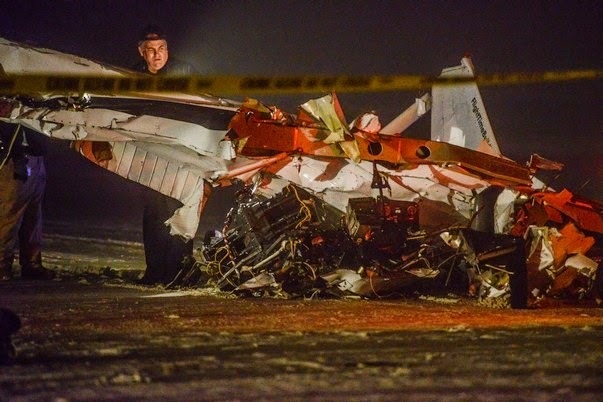 Although the pilot held an instrument rating and had recently completed an instrument proficiency check, on the night of the accident, she did not demonstrate the skills necessary to control an airplane in IMC. She also did not display the ability to adequately communicate her situation to the controller, nor did she seem to understand or comply with the assistance offered to her. Review of autopsy results and postaccident toxicological testing showed no evidence of any physiologically induced incapacitation or other impairment. During the sequence of events leading up to the accident, the pilot communicated with two air traffic controllers. The pilot described that she was operating in conditions that limited her ability to navigate and potentially affected her ability to control the airplane under visual flight rules (VFR). Although the actions of the controllers did not directly contribute to the pilot’s loss of control while attempting to fly under VFR in IMC, the controllers did not act in accordance with Federal Aviation Administration (FAA) guidance that dictates how to assist pilots experiencing this type of emergency. Specifically, the controllers did not ascertain if the pilot was qualified and capable of IFR flight nor did they attempt to locate and direct the pilot toward the nearest areas reporting visual meteorological conditions. Further, a controller assisting the accident controller had the opportunity to solicit a pilot report from another pilot in a nearby airplane to ascertain if that airplane was operating above the reported IMC but did not do so. During postaccident interviews, the air traffic controllers indicated that they had not received FAA-required evidence-based simulation training on emergencies and described the computer-based emergency training that they received as poor quality. The pilot's failure to maintain control of the airplane while operating under visual flight rules (VFR) in night, instrument meteorological conditions, likely due to spatial disorientation. Contributing to the outcome was the radar controller's failure to follow published guidance for providing assistance to VFR pilots having difficulty flying in instrument conditions. 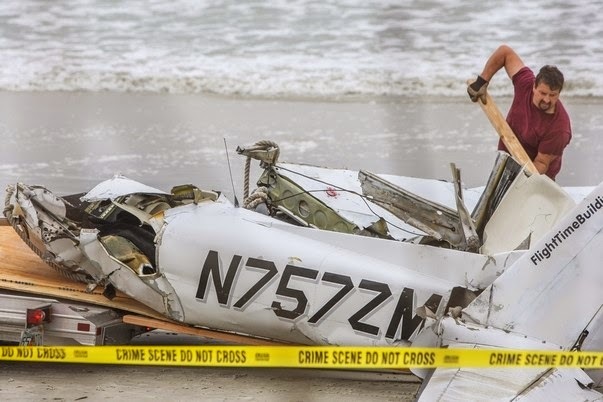 On January 13, 2015, about 2058 eastern standard time, a Cessna 152, N757ZM, collided with a public beach at New Smyrna Beach, Florida. The commercial pilot was fatally injured and the airplane was substantially damaged by impact forces. The airplane was registered to a private company and was operated by the pilot under the provisions of Title 14 Code of Federal Regulations (CFR) Part 91 as a personal flight. Night, instrument meteorological conditions (IMC) prevailed for the flight, and no flight plan was filed. The local flight originated from Massey Ranch Airpark (X50), Edgewater, Florida, about 2040. Prior to the accident flight, the pilot, who was a Japanese citizen, contacted Flight Time Building LLC to purchase a block of flight time in a Cessna 152. According to the company's website, the company sold "blocks" of flight time to licensed pilots, with 50 hours being the minimum-sized block. The company normally dispatched an airplane to the pilot upon completion of a ground and flight "checkout." According to the owner of Flight Time Building, on the day prior to the accident, the pilot flew a local flight with an instructor, followed by a cross country flight with a safety pilot, who was an instructor-in-training. The owner reported that the pilot was not "signed off" for solo flight after the flights on January 12. The flight instructor stated that he needed to see "improved landings" before he could approve her for solo flight. On the day of the accident, she flew an undetermined number of local, solo flights without the knowledge of Flight Time Building personnel. She possessed the keys to the accident airplane since she had flown it on the previous day with the safety pilot. She refueled the airplane at her own expense and initiated the accident flight, which was a local, night flight in the traffic pattern at X50. At 2042:03, a radar target correlated to be the accident airplane was about 1 nautical mile (nm) south of X50. Radar data indicated the aircraft was in a left, 360-degree turn. At 2047:22, the accident pilot pilot transmitted on the emergency frequency, 121.5 MHz, "hello," followed by two more transmissions of the her saying "hello." This coincided with radar data that depicted the accident aircraft emitting a transponder code of, or "squawking," 7700 (emergency) about 3.5 nm south of X50, or about 8.4 nm south of New Smyrna Beach airport (EVB). At 2047:42, the pilot stated "uh I don't know where I am I want to land." At 2047:52, the Daytona Beach (DAB) Radar South controller transmitted, "The aircraft that doesn't know where they are at; are they at 1,700 feet squawking emergency and 1200?" At 2048:21, the pilot transmitted "I want to land." The EVB local controller heard the pilot asking for assistance on 121.5 MHz. Because the aircraft was close to EVB, he was able to establish communications. Between 2048 and 2053, the EVB local controller provided assistance to the pilot. The pilot advised the EVB air traffic controller that she could see the ground but could not maintain visual flight conditions. When the EVB local controller turned the pilot toward EVB, the pilot reported that she could see the airport, but a short time later said she could no longer see it. The EVB local controller then attempted to transfer communications to DAB approach control on 125.35 MHz. At 2053:52, the EVB local controller advised DAB ATC that the aircraft was proceeding towards DAB, and that EVB would have the lights set on high intensity if they needed the airport. The DAB Radar South controller replied, "thanks, we are going to try it." At 2054:35, the pilot of N757ZM transmitted "hello" on the emergency frequency 121.5, and at 2054:41 continued, "on 125.25 no ah contact." The pilot had been instructed by EVB to contact DAB on 125.35 MHz. The DAB Radar South controller responded on 121.5 by asking the pilot if she could hear DAB. At 2054:49, the pilot again transmitted that she was unable to reach anybody on 125.25. The DAB air traffic controller replied "ok just stay on this frequency you are all right, maintain your present altitude." The EVB local controller informed the DAB air traffic controller that the pilot could not hear DAB on 125.35. DAB advised the EVB local controller that the pilot was on the wrong frequency, and that the DAB controller would assist the pilot on the emergency frequency. At 2055:15, the pilot transmitted "hello." The DAB air traffic controller established communications with the pilot on 121.5 and asked the pilot if she could hear DAB; the pilot responded, "I can hear you." At 2055:22, the DAB controller instructed the pilot to "remain calm and to maintain present altitude." The DAB controller told the pilot to continue the right turn northbound towards EVB, and that the airport would be off the right side. The DAB controller added that EVB would have all the runway lights turned on to high and instructed the pilot to advise when she saw the lights. At 2055:40, the pilot transmitted on 121.5 that she was heading 100 degrees, and asked the DAB air traffic controller what heading she needed to fly. The DAB air traffic controller told the pilot that if she were able, to turn left heading 360 and that EVB would be at the pilot's 12 o'clock position and one and a half nautical miles. After an unintelligible transmission from the pilot, the DAB controller told the pilot she was not required to read back any further transmissions, and to make the turn. The DAB controller instructed the pilot to advise when she saw the lights at EVB. The pilot verified the heading and asked if she needed a left turn, heading 300. The DAB air traffic controller instructed the pilot to continue a left turn, heading 360 and reiterated the EVB position relative to the aircraft. The pilot acknowledged the turn. At 2056:57, the DAB air traffic controller told the pilot to land any runway at EVB if she saw the runway lights. At 2057:06, the pilot stated she was at 600 feet and the DAB air traffic controller instructed the pilot to maintain her altitude until she saw the airport. The pilot replied that she was in the clouds. The DAB controller told the pilot, "okay don't worry, don't worry, don't worry, don't worry ma'am, just calm down, calm down; make a left turn." The DAB air traffic controller then instructed the pilot to make a left turn to climb because she had been in a descent. The DAB air traffic controller advised the pilot it was okay to be in the clouds but that she needed to climb. At 2057:48, the DAB controller asked the pilot if she was climbing, and told her that she needed to maintain at least 1,000 feet. The pilot acknowledged the climb to 1,000 feet, followed by an unintelligible transmission. The DAB air traffic controller reiterated the climb to 1,000 feet and for the pilot to advise DAB when she was comfortable. There were no further transmissions from the pilot. 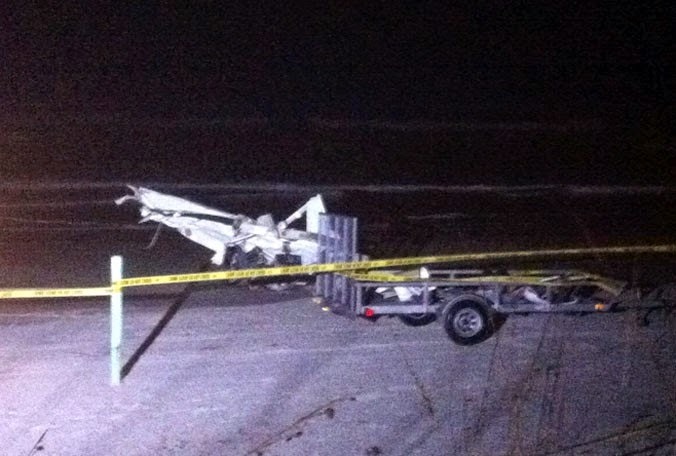 A short time later, radar and radio contact was lost and the airplane crashed onto New Smyrna Beach, in shallow water. Radar data indicated a descending, right turn prior to impact. The altitude of the last observed radar target was 500 feet above mean sea level. Emergency responders arrived at the accident site shortly thereafter in an attempt to provide assistance. The pilot, age 38, held a commercial pilot certificate with ratings for airplane single engine land, airplane multi-engine land, and instrument airplane. She was issued a Federal Aviation Administration (FAA) third-class medical certificate on August 18, 2014, with a restriction to wear corrective lenses. Pilot records recovered from the wreckage indicated that the pilot had logged about 416 total hours of flight experience as of January 7, 2015. She had logged about 1.3 hours of night time and about 6.1 hours of actual instrument time prior to the accident flight. Logbook entries showed that she completed a 14 CFR Part 61.55 flight review and a 14 CFR 61.57(d) instrument proficiency check (IPC), in a Cessna 152, at Torrance, California on November 19, 2014. The flight review and IPC were performed with different flight instructors. Her pilot logbook indicated she flew about 2.4 hours on June 30, 2014, in a Beech BE-58 and did not log another flight prior to her flight review and IPC of November 19, 2014. FAA inspectors interviewed the flight instructors who performed the flight review and IPC. Both flight instructors reported that the accident pilot showed no weaknesses, handled the radios during the flight, was familiar with the local area, and was a "good pilot." The airplane was a Cessna model 152 that was manufactured in 1977. The high-wing, fixed tricycle landing gear airplane was powered by a Lycoming O-235-L2C engine, rated at 110 horsepower at 2,550 rpm and was equipped with a Sensenich 72CK56-0-54 metal, fixed-pitch propeller. According to the maintenance logbooks provided by the owner, the most recent annual inspection of the airframe and engine was completed on October 27, 2014, at 502.1 hours tachometer time. The observed tachometer time at the time of the accident was 525.8 hours. The aircraft total time was not recorded in on the logbook entries, and the owner estimated that the total time of the airframe was about 12,000 hours. The National Weather Service (NWS) Surface Analysis Charts for 1900 and 2200 on January 13, 2015 depicted a cold front moving across central into southern Florida with cold air stratus clouds behind the front. Numerous station models behind the front depicted visibilities restricted in mist or fog, with temperature-dew point spreads of less than 5° F, and in the vicinity of the accident site less than 3° F.
The NWS Weather Depiction Chart for 2000 depicted an extensive area of IMC extending from the accident site and across most of all of central and northern Florida, Georgia, South Carolina, portions of southern and eastern North Carolina, and portions of Tennessee, Alabama, Mississippi, and Louisiana. A second area of IMC was also identified over southern Florida ahead of the front in the vicinity of West Palm Beach with marginal visual meteorological conditions extending through most of central and into southern Florida. The closest visual meteorological conditions with ceilings above 3,000 feet and visibility greater than 5 miles were over southwestern Florida, and extreme south Florida. The chart indicated that fog and low ceilings were not a localized event over the New Smyrna Beach area, but extended over most of the area. The National Center for Atmospheric Research regional radar mosaic for 2100 depicted no significant weather echoes associated with rain showers or thunderstorms in the vicinity of the accident site during the period. The NWS 12-hour Low-Level Significant Weather Prognostic Chart valid for 0100 and available for briefing prior to the accident depicted the cold front moving across southern Florida with an extensive area of IMC expected over most of all of Florida, Georgia, South Carolina, Alabama, and into sections of Mississippi, and Tennessee. The chart depicted no significant turbulence outside of convective activity was expected, and depicted the freezing level near 12,000 feet over the region. No weather reporting capability was present at X50. A review of the observations surrounding the area indicated that at the time the accident airplane departed from X50, IMC were already being reported surrounding the area at EVB, DAB, and to the south at the NASA Shuttle Landing Facility (TTS), Titusville, Florida. EVB was located approximately 5 nm north of the departure airport at an elevation of 10 feet, and less than 3 miles west of the accident site. The airport had an Automated Weather Observation System. The weather conditions reported at 2055, or about 3 minutes prior the accident, included wind from 350° at 8 knots, visibility 8 statute miles, ceiling overcast at 500 feet, temperature 17° Celsius (C), dew point 16° C, altimeter 30.14 inches of mercury (Hg). The next closest weather reporting station was DAB, located approximately 14 nm northwest of the departure airport at an elevation of 34 feet. The airport had a control tower and a federally installed and maintained Automated Surface Observation System (ASOS). The weather conditions reported at 2053, or about 5 minutes prior the accident, included wind from 020° at 9 knots, visibility 10 statute miles, ceiling overcast at 700 feet, temperature 18° C, dew point 16° C, and altimeter 30.14 inches of Hg. The DAB special weather report at 2131 included wind from 360° at 11 knots gusting to 17 knots, visibility 1 statute mile, ceiling overcast at 400 feet, temperature 16° C, dew point 15° C, and altimeter 30.15 inches of Hg. The DAB special weather report at 2146 included wind from 360° at 8 knots, visibility ½ statute mile in fog, ceiling overcast at 300 feet, temperature 16° C, dew point 15° C, and altimeter 30.15 inches of mercury. Remarks: automated observation system, tower visibility 1-mile, temperature 15.6° C, dew point 15.0° C.
Orlando Sanford International Airport (SFB), Orlando, Florida, was located 20 nm southwest of the departure airport at an elevation of 55 feet, and was equipped with an ASOS. The weather conditions reported at SFB, at 2100, included wind from 360° at 9 knots, visibility 10 statute miles, ceiling broken at 1,000 feet, overcast at 3,900 feet, temperature 19° C, dew point 17° C, altimeter 30.14 inches of Hg. On the day of the accident, sunset occurred about 1745 and evening civil twilight occurred about 1811. Moonrise occurred at 0029, and moonset occurred at 1212. The DAB North Controller, who assisted the accident controller, solicited pilot reports (PIREPS) for the DAB local area earlier in her shift, but could not recall their specific content. During the accident sequence, she had been working a Cirrus SR22, whose pilot requested the RNAV runway 29 approach into EVB. The SR22 was at 3,000 feet holding at RISRE, about 10 NM east of EVB and near the accident aircraft, but she did not solicit a PIREP from the pilot or ask about cloud tops. a. If a VFR aircraft requests radar assistance when it encounters or is about to encounter IFR weather conditions, ask the pilot if he/she is qualified for and capable of conducting IFR flight. b. If the pilot states he/she is qualified for and capable of IFR flight, request him/her to file an IFR flight plan and then issue clearance to destination airport, as appropriate. 1. Inform the pilot of airports where VFR conditions are reported, provide other available pertinent weather information, and ask if he/she will elect to conduct VFR flight to such an airport. (b) Refuses to declare an emergency and you have determined the exact nature of the radar services the pilot desires. 3. If the aircraft has already encountered IFR conditions, inform the pilot of the appropriate terrain/obstacle clearance minimum altitude. If the aircraft is below appropriate terrain/obstacle clearance minimum altitude and sufficiently accurate position information has been received or radar identification is established, furnish a heading or radial on which to climb to reach appropriate terrain/obstacle clearance minimum altitude. a. Avoid radio frequency changes except when necessary to provide a clear communications channel. b. Make turns while the aircraft is in VFR conditions so it will be in a position to fly a straight course while in IFR conditions. c. Have pilot lower gear and slow aircraft to approach speed while in VFR conditions. d. Avoid requiring a climb or descent while in a turn if in IFR conditions. f. Vector aircraft to VFR conditions. 1. TERMINAL. Assign a beacon code that will permit terminal minimum safe altitude warning (MSAW) alarm processing. The wreckage was located in shallow water at approximate coordinates 29 02 22.68N, 080 53 52.69W. 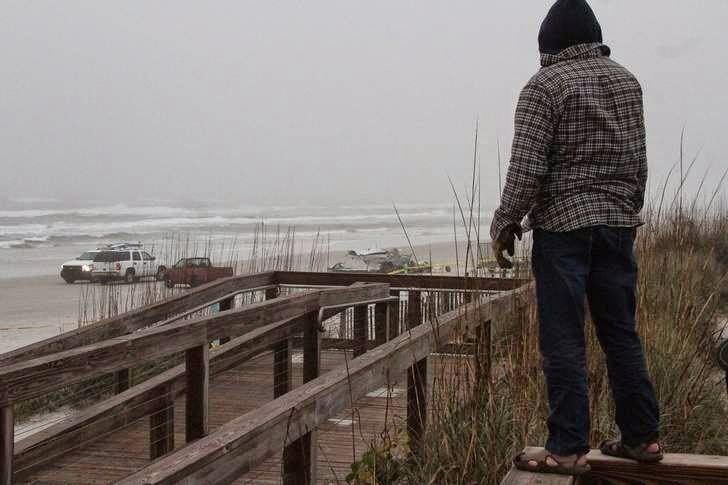 The wreckage was pulled onto the beach by local authorities after coordination with the NTSB investigator-in-charge to prevent further damage and loss of parts. The left and right wings separated from the fuselage during the impact sequence. The outboard 4 feet of the left wing was separated from the remainder of the wing. The right wing exhibited diagonal and aft crush deformation, beginning 2 feet from the wing root to the aft spar at the wing tip. Aileron control cable continuity was established through multiple recovery cuts and fractures consistent with overstress. A majority of the left aileron was not located. The wing flap actuator was found in the retracted (flaps up) position. The fuselage was separated into multiple sections, including a section consisting of the engine firewall and instrument panel, the landing gear and cabin floor, and an 8-foot section of aft fuselage. The right main landing gear was not recovered. The nose landing gear was separated and located with the main wreckage. The empennage separated aft of station 173. The horizontal and vertical stabilizers remained attached. The outboard half of the right horizontal stabilizer leading edge was crushed in an up and aft direction. Rudder and elevator control cable continuity was established through multiple recovery cuts and fractures consistent with overstress. Both wing fuel tanks were breached during the impact sequence and no residual fuel of found. The fuel selector handle was found in the "on" position and the unit operated normally in the "on" and "off" positions when forced air was introduced into the selector valve. Sand was found in the fuel strainer bowl and screen. The odor of fuel was observed in the strainer bowl. The propeller separated from the crankshaft flange and was found partially buried in sand at the location of the main wreckage. The blades exhibited twisting deformation, leading edge gouges, and surface polishing. The engine was separated from the firewall. The carburetor, carburetor air box, and alternator were missing and were not located. All engine components were subjected to salt water and sand immersion. The carburetor flange was fractured from impact and was still attached to the oil sump. The carburetor data plate was lodged into the induction tube at the oil sump. The valve covers, magnetos, vacuum pump, and exhaust were removed by investigators. Mechanical internal continuity was established by rotating the rear accessory gears at the vacuum pump drive with a mechanical device. All valve action was confirmed through 720 degrees of crankshaft rotation and thumb suction and compression was observed at all cylinders. A digital video boresope examination of the interior of the cylinders and the piston surfaces revealed normal operating signatures. The magnetos were turned with a hand drill and by hand rotation; no spark could be produced. The spark plug electrodes were normal in appearance except for salt water, oil, and sand contamination. The inspection of the engine did not reveal any abnormalities that would have prevented normal operation or production of rated horsepower. A postmortem examination of the pilot was performed at the offices of the District 7 Medical Examiner, Daytona Beach, Florida, on January 14, 2015. The autopsy report noted the cause of death as "Multiple Blunt Traumatic Injuries" and the manner of death was "Accident." Forensic toxicology testing of the pilot was performed on specimens of the pilot by the FAA Bioaeronautical Sciences Research Laboratory (CAMI), Oklahoma City, Oklahoma. The CAMI toxicology report indicated negative for carbon monoxide, ethanol, and drugs. Testing for cyanide was not performed. "Operating in marginal VFR /IMC conditions is more commonly known as scud running. According to National Transportation Safety Board (NTSB) and FAA data, one of the leading causes of GA accidents is continued VFR flight into IMC. As defined in 14 CFR part 91, ceiling, cloud, or visibility conditions less than that specified for VFR or Special VFR is IMC and IFR [instrument flight rules] applies. However, some pilots, including some with instrument ratings, continue to fly VFR in conditions less than that specified for VFR. The result is often a CFIT [controlled flight into terrain] accident when the pilot tries to continue flying or maneuvering beneath a lowering ceiling and hits an obstacle or terrain or impacts water. The accident may or may not be a result of a loss of control before the aircraft impacts the obstacle or surface. The importance of complete weather information, understanding the significance of the weather information, and being able to correlate the pilot's skills and training, aircraft capabilities, and operating environment with an accurate forecast cannot be emphasized enough." According to FAA Advisory Circular AC 60-4A, "Pilot's Spatial Disorientation," tests conducted with qualified instrument pilots indicated that it can take as long as 35 seconds to establish full control by instruments after a loss of visual reference of the earth's surface. AC 60-4A further states that surface references and the natural horizon may become obscured even though visibility may be above VFR minimums and that an inability to perceive the natural horizon or surface references is common during flights over water, at night, in sparsely populated areas, and in low-visibility conditions. According to the FAA Airplane Flying Handbook (FAA-H-8083-3), "Night flying is very different from day flying and demands more attention of the pilot. The most noticeable difference is the limited availability of outside visual references. Therefore, flight instruments should be used to a greater degree.… Generally, at night it is difficult to see clouds and restrictions to visibility, particularly on dark nights or under overcast. The pilot flying under VFR must exercise caution to avoid flying into clouds or a layer of fog." The handbook described some hazards associated with flying in airplanes under VFR when visual references, such as the ground or horizon, are obscured. "The vestibular sense (motion sensing by the inner ear) in particular tends to confuse the pilot. Because of inertia, the sensory areas of the inner ear cannot detect slight changes in the attitude of the airplane, nor can they accurately sense attitude changes that occur at a uniform rate over a period of time. On the other hand, false sensations are often generated; leading the pilot to believe the attitude of the airplane has changed when in fact, it has not. These false sensations result in the pilot experiencing spatial disorientation." (1) Safety alerts and traffic advisories, to include Minimum Safe Altitude Warning (MSAW) procedures and the relationship between charted minimum altitudes and underlying topography. (2) Weather and other conditions that affect flight (e.g., icing, thunderstorms, windshear, and VFR aircraft that encounter instrument flight rules (IFR) conditions). (3) Bird activity information and dissemination. (4) Wake turbulence information and application. (5) Line up and wait (LUAW). (7) Recovery in ATC Operations. b. Refresher Training. Each facility must maintain, in writing, an annual (calendar year) refresher training plan. Annual refresher training contains two elements: nationally and/or facility-developed curriculum and simulation training. Facilities are encouraged to review their quality control data (e.g., Quality Control Monitoring, Service Reviews, and Compliance Verification and data available in the Partnership for Safety Portal) to identify additional topics for annual refresher training in order to meet each facility's changing needs. The following topics must be included unless designated by the TA as not applicable. (a) A minimum of one hour of evidence-based simulation training in calendar year 2014. 17. Evidence-based Training: Training based on an analysis of safety data. All of the air traffic controllers indicated the recurrent training required by the FAA was lacking, and they couldn't remember any substance of the topics. All of the recurrent training they could remember was via computer-based instruction or by slide-based presentation. Both of the air traffic controllers on duty the night of the accident could not recall any refresher training utilizing the simulator as required, and the supervisor indicated most controllers viewed the training as an annoyance. 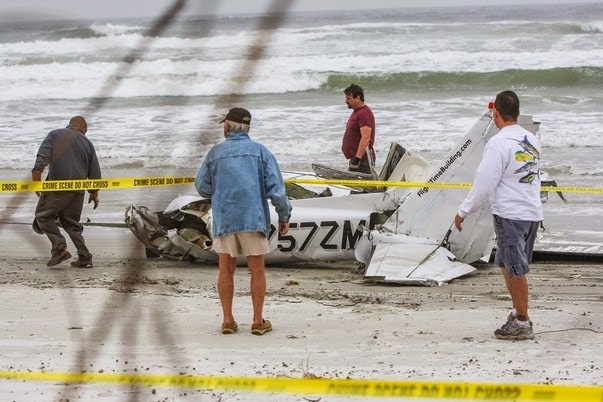 On January 13, 2015, about 2058 eastern standard time (EST), a Cessna 152, N757ZM, collided with a public beach at New Smyrna Beach, Florida. The commercial pilot was fatally injured and the airplane was substantially damaged by impact forces. The airplane was registered to a private company and was operated by the pilot under the provisions of 14 Code of Federal Regulations Part 91 as a personal flight. Night, instrument meteorological conditions prevailed for the flight, and no flight plan was filed. The local flight originated from Massey Ranch Airpark (X50), Edgewater, Florida, about 2030. Prior to the accident flight, the pilot, who was a Japanese citizen, contacted Flight Time Building LLC to purchase a block of flight time in a Cessna 152. According to the company's website, the company sells "blocks" of flight time to licensed pilots, with 50 hours being the minimum-sized block. The company dispatches an airplane to the pilot upon completion of a ground and flight "checkout." According to the owner of Flight Time Building, on the day prior to the accident, the pilot flew a local flight with an instructor, followed by a cross country flight with a safety pilot, who was an instructor-in-training. The owner reported that the pilot was not "signed off" for solo flight after the flights on January 12. On the day of the accident, she flew an undetermined number of local, solo flights without the knowledge of Flight Time Building personnel. She possessed the keys to N757ZM since she had flown it on the previous day with the safety pilot. She refueled the airplane at her own expense and initiated the accident flight, which was a local, night flight in the traffic pattern at X50. An initial review of available radar data indicated that the pilot climbed to about 1,000 feet above mean sea level (msl) and was flying in the visual traffic traffic pattern at X50. The airplane was later observed in a climb to 1,700 feet msl and then a descent to 1,200 feet msl. During this time, the pilot set the airplane's transponder to 7700 (emergency) for about a minute. She began transmitting on guard (emergency) frequency and informed air traffic control (ATC) that she could not maintain visual flight rules (VFR) and could not see X50. Controllers provided assistance and directed her toward New Smyrna Beach Airport (EVB). The pilot informed ATC that she was at 600 feet and ATC directed her to climb. 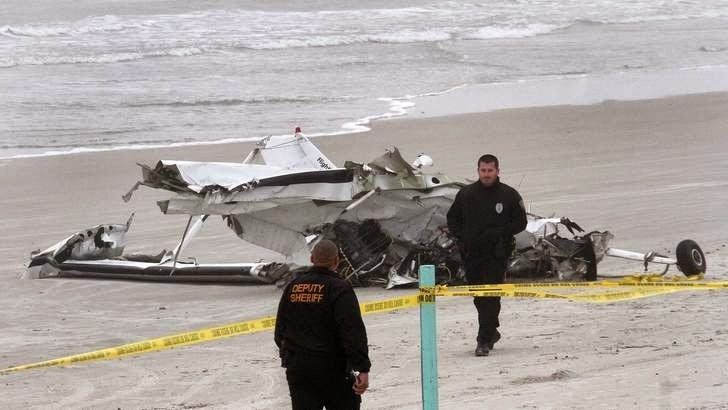 A short time later, radar and radio contact was lost and the airplane crashed onto New Smyrna Beach, in shallow water. Emergency responders arrived shortly thereafter in an attempt to provide assistance. Weather conditions at EVB included an overcast ceiling at 500 feet and 8 statute miles visibility. 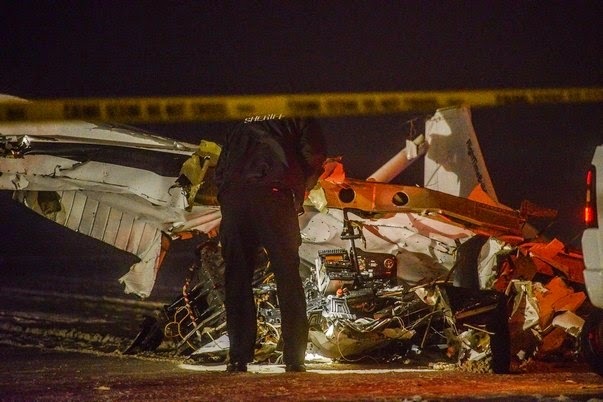 A preliminary review of pilot records recovered from the wreckage indicated that the pilot had logged about 416 hours total time as of January 7, 2015. Logbook entries showed that she completed a 14 CFR Part 61.55 flight review and a 14 CFR 61.57(d) instrument proficiency check, in a Cessna 152, at Torrance, California on November 19, 2014. Tabata’s Facebook page contains a post from January 11, 2015 that appears to show a navigational map of New Smyrna Beach. 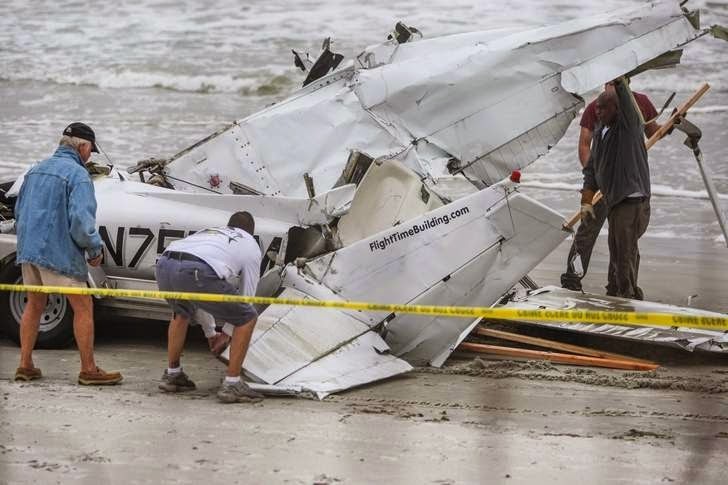 NEW SMYRNA BEACH — The Japanese pilot killed when her plane plunged into the ocean was rated to fly “blind” in the poor visual conditions she experienced. The pilot was identified as 38-year old Mihoko Tabata, according to the Volusia County Sheriff’s Office. 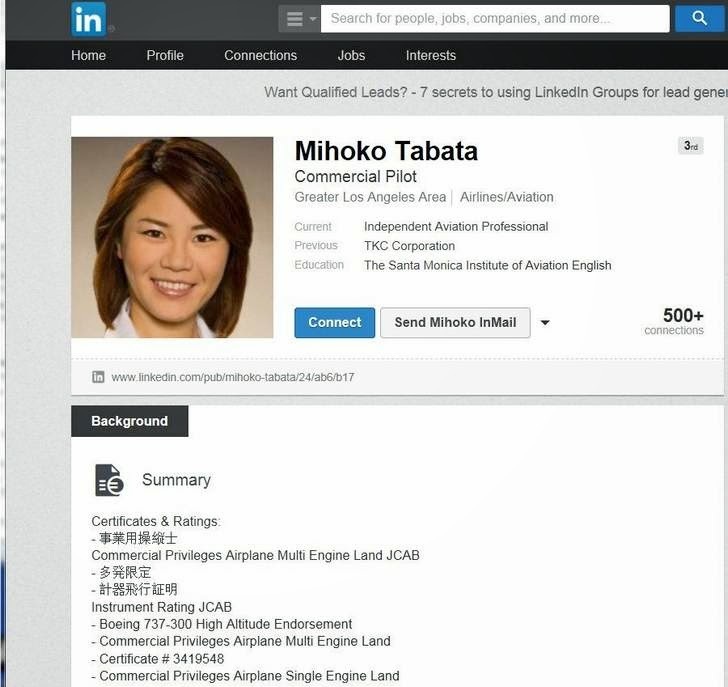 In Tabata’s LinkedIn profile she listed herself as a commercial pilot from the greater Los Angeles area. Tabata took off Tuesday in a single-engine Cessna 152 from Massey Ranch Airpark in Edgewater, but sometime during her flight told air traffic controllers with the Daytona Beach control tower that she didn’t know where she was and wanted to land. Controllers tried to guide Tabata to New Smyrna Beach Municipal Airport and urged her to climb in altitude to 1,000 feet. Tabata told controllers she had descended to 600 feet seconds before she lost contact with the tower, according to a digital recording. Emergency crews responded to the plane crash about 9 p.m. and the wreckage was spotted about 20 feet offshore by the first units to arrive on scene. Based on the preliminary autopsy results, Tabata’s death has been determined to be the result of injuries suffered in the crash, sheriff’s spokesman Gary Davidson said in statement. Tabata is from Japan, although she has been living in the United States off and on and most recently came to Volusia County on Saturday, Davidson said. Her family lives in Japan and was located and notified of her death through the assistance of the Japanese consulate in Miami, he said. Neil Ramphal, owner of the plane Tabata was flying, said she did not have permission to fly the aircraft by herself. Ramphal said Tabata had 420 hours of flight time and was trying to reach 500 hours at his company Flight Time Building, which offers personal flight instruction and specializes in providing planes for pilots to build their flight times. Tabata had been at Flight Time Building since Jan. 10, Ramphal said. Tabata’s Facebook page contains a post from Jan. 11 that appears to show a navigational map of New Smyrna Beach. In 2013, the Federal Aviation Administration raised its qualification standards for commercial pilots, requiring that they have at least 1,500 hours flight time. However, the 500 hours Tabata was trying to achieve possibly could have allowed her to compete for a job with a foreign airline, said Tim Brady, dean of the College of Aviation at Embry-Riddle Aeronautical University in Daytona Beach. “Depending on the type of flight program, training program she was in, she would have gotten her instrument rating at somewhere around 250, 350 hours, somewhere in that neighborhood,” Brady said. An AIRMET, an advisory to pilots for potentially hazardous weather conditions, had been issued twice for the area on Tuesday warning of visibility of less than three miles and cloud ceilings of below 1,000 feet, said Tony Cristaldi, meteorologist and aviation program manager with the National Weather Service office in Melbourne. The AIRMET advisories are issued out of the Aviation Weather Center in Kansas City, Missouri, Cristaldi said. “You have to be rated as having the ability to fly on instruments, basically flying blind just looking at instruments in order to fly in those type of conditions,” Cristaldi said. Ralph Hicks, senior air safety investigator for the National Transportation Safety Board, said Wednesday that Tabata was a certificated instrument pilot. “She was qualified for single-engine airplane, multi-engine airplane and instrument airplanes, which meant she had an instrument rating and the information I’m getting early on is that she was current with her instrument rating,” Hicks said. Wreckage from the plane has been moved to Ramphal’s hangar at Massey Ranch Airpark and the beach has been cleared, Davidson said. Hicks said Wednesday that a preliminary report on the crash would likely be completed within seven days. NEW SMYRNA BEACH -- Investigators in Volusia County have released the name of the pilot who died after her plane crashed Tuesday night in the water off New Smyrna Beach. The pilot, identified as Mihoko Tabata, was originally from Japan, and had been living in the United States on and off. She most recently came to Volusia County on Saturday, Jan. 10, three days before the crash. Volusia County deputies said Tabata's family in Japan has been notified of her death via the Japanese consulate in Miami. Tabata was flying a Cessna 152 Tuesday night and told the flight control tower in Daytona Beach that she didn't know where she was. Pilot: I don't know where I am. I want to land. Tower: Maintain your altitude until you see the airport. Pilot: I am in clouds. Tower: Don't worry, ma'am, just calm down. Make a left turn; just make a left turn if you can. I need you to climb though. Climb, you're descending. It's OK if you're in the clouds, but I need you to climb. That was the pilot's final transmission before traffic control called 911. 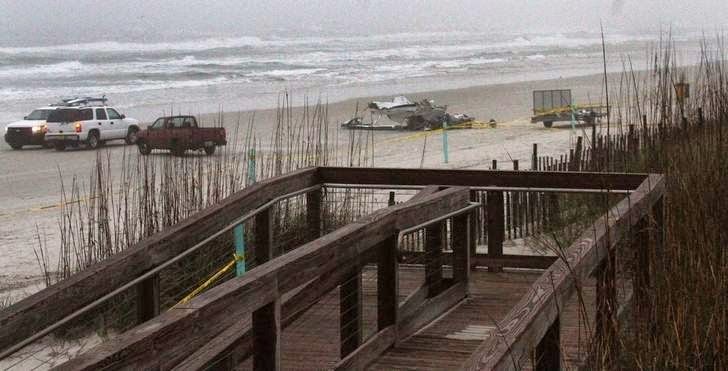 The remains of the aircraft were removed from the beach Wednesday. The National Transportation Safety Board has begun working to figure out what caused the crash. A preliminary report is expected to be released within seven days. Investigators said Tabata was certified to fly a single-engine or multi-engine aircraft. A group of student pilots in the same area at the time of the crash said weather conditions were treacherous Tuesday night. 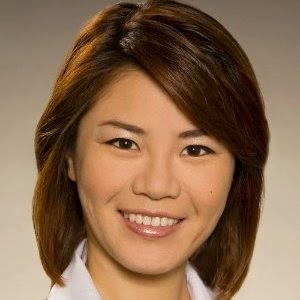 New Smyrna Beach, FL – A 38-year-old native of Japan is the female pilot who died in a plane crash just off-shore of New Smyrna Beach on Tuesday night. The Volusia County Sheriff’s Office says Mihoko Tabata – a woman who lived in the United States off-and-on – was behind the controls of a Cessna 152 when it crashed into the ocean surf just north of the Flagler Avenue beach approach. Authorities say it all started around 9pm Tuesday when Tabata radioed for help soon after takeoff from Massey Ranch Airpark in Edgewater, saying she was turning back due to the weather conditions. First units arrived on scene around 5 minutes after 911 got the call for help and found the mangled plane bobbing in the surf about 20 feet from shore, with Tabata’s body mixed in with the wreckage. Authorities believe she was the only person on board at the time. In an interview the day after with WNDB’s Marc Bernier, Volusia County Sheriff Ben Johnson said it appears Tabata wasn’t authorized to be flying solo and had been warned not to fly in rough weather. Conditions were foggy and rainy at the time of the accident. It’s unclear at this time if there are any mechanical issues which might have caused the plane to crash. The Federal Aviation Administration and the National Transportation Safety Board are investigating. Pieces of the mangled plane were pulled from the ocean water and are now in the FAA and NTSB’s hands as part of their investigation. 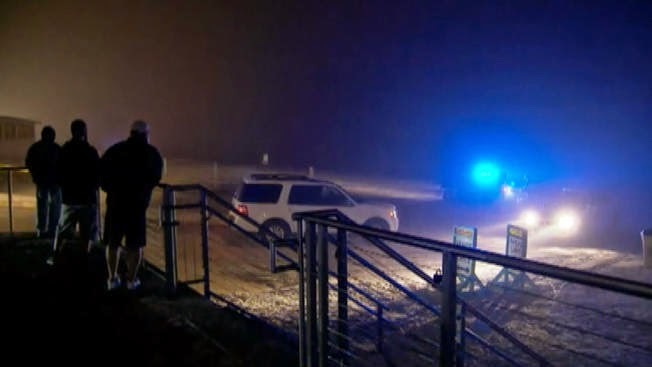 NEW SMYRNA BEACH — The 38-year old woman killed after the plane she was piloting through dense fog crashed into the ocean told air traffic controllers she was lost just minutes before she stopped communicating with the tower. Air traffic controllers tried to guide the woman, who took off Tuesday from Massey Air Park in Edgewater, to make a left turn to reach New Smyrna Beach Municipal Airport and told her to climb to 1,000 feet. During the course of the roughly 10 minutes of contact with the tower, the pilot said she was at 900 feet and at another point that she had descended to 600 feet. The pilot then, sounding panicked, told controllers she was in the clouds. Controllers lost contact with the plane seconds later. The pilot did not have permission to fly the plane by herself, the owner of the aircraft said Wednesday. “She was a time builder and she had not been checked out to fly the airplane by herself yet and she took it upon herself to go fly,” said Neil Ramphal, owner of Flight Time Building, which owns the plane. Kirkland and Burkhead said that when they arrived at the beach they saw the plane floating in the water. Several bystanders told them the pilot was still inside the aircraft. The two officers waded into the cold ocean and pulled the woman from the wreckage and onto shore. Kirkland felt for her pulse, but there was none, the report shows. The policemen went back into the ocean after someone said there was another person in the water, their report shows. The officers and a bystander flipped the plane over, but no one else was inside. Investigators were at the crash scene Wednesday trying to piece together what happened to the single-engine Cessna 152. Ralph Hicks, senior air safety investigator with National Transportation Safety Board, said the pilot was rated a certificated instrument pilot on single-engine or multi-engine aircraft. Crime scene tape blocked the wreckage area on the beach, just a short distance from busy Flagler Avenue as beachgoers began their early morning walks. By mid afternoon the fuselage had been removed from the beach as the tide rolled in. “Sad story,” said Jim Musante, one of the steady stream of people who passed by Esther Street Beachfront Park to get a glimpse of the wreckage before it was moved. Many, like Musante, snapped pictures with their phones. 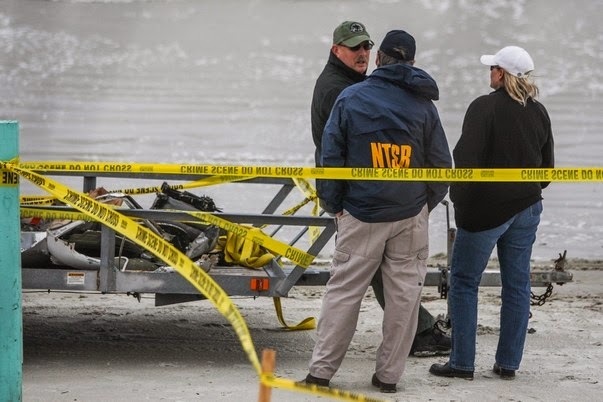 The identity of the female pilot, whose body was pulled from the sea late Tuesday night, will be released once her identity is confirmed through autopsy and her family has been notified, said Gary Davidson, spokesman for the Volusia County Sheriff’s Office. He didn’t know if that identification would be made Wednesday. Instructors for Flight Time Building said the woman was a good pilot, Ramphal said. Flight Time Building is a company that offers personal flight instruction and specializes in providing planes for pilots to build their flight times. Ramphal could not explain why the pilot was flying solo, other than to say she had the keys and it was an uncontrolled airport. The Sheriff’s Office doesn’t know what time the plane took off from Massey Air Park, Davidson said. 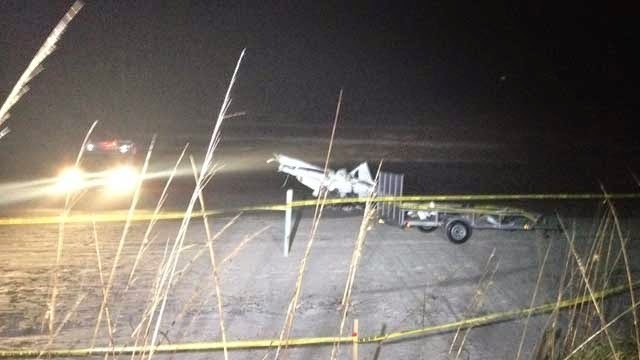 The Daytona Beach FAA tower reported getting a final radar hit from the aircraft about a quarter-mile offshore Tuesday night as the plane was turning back toward the beach, he said. Emergency crews from multiple law enforcement agencies quickly responded. The wreckage was spotted about 20 feet offshore in waist-deep water. Beach officers attached tow ropes to the plane and pulled the major pieces of the wreckage to shore. Smaller pieces also were gathered and placed on the beach to await further investigation. Instead of his usual morning beach walk, John Kiernon, who lives on the North Causeway, decided to check out the scene from Esther Street Beachfront Park, where media staged to report on the crash. Hicks said a preliminary report on the crash would likely be released within a week. “We’ll probably be here two or three days, documenting the wreckage in great detail,” he said. NEW SMYRNA BEACH -- The woman who died when her plane crashed off New Smyrna Beach Tuesday night told the Daytona Beach Control Tower that she didn't know where she was. What was left of the Cessna 152 was removed from the beach Wednesday afternoon, hauled off to a hangar where investigators will comb through the wreckage and the pilot's log to try to answer key questions. Among them, what was weather like when she was flying, and what caused the crash? Student pilot Antonio Olear and his classmates were on the road after flight school at the same time the Cessna 152 crashed. They know what conditions were like Tuesday night. "Overall dangerous. Half a mile visibility, strong winds coming from various directions, just foggy overall," said Olear. NTSB investigator Ralph Hicks said the pilot was rated a certificated instrument pilot on single engine or multi engine aircraft. "The information that I'm getting early on is that she was current with her instrument rating," said Hicks. However, something went wrong after the pilot took off from the Massey Air Park. Olear and his friends listened to the final transmission between the pilot and the Daytona Beach control tower. Pilot: "I am in clouds." Tower: Don't worry ma'am, just calm down, make a left turn, just make a left turn if you can. I need you to climb though, climb, you're descending. It's ok if you're in the clouds but I need you to climb. Dispatch: 911, what's your emergency? 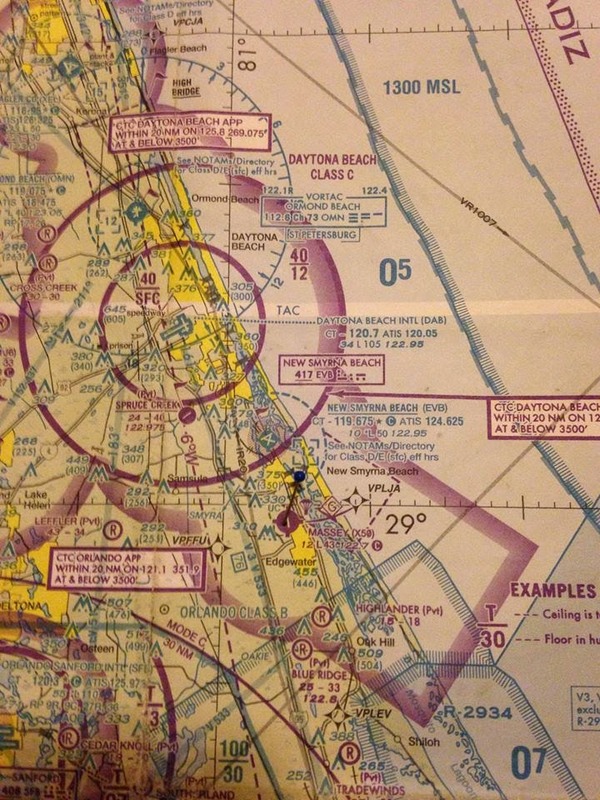 Daytona Beach Tower: This is Daytona Beach Traycom, I've got a potential downed aircraft southeast of New Smyrna Beach. Dispatch: Ok potential bound aircraft? "She was just scared out of her mind, lost in a cloud of mist," said Olear after hearing the transmission. "You don't see anything, battling strong wind conditions coming from different ways, I mean she was just trying to find her way home and she couldn't." Rescue workers recovered the pilot's lifeless body shortly after the crash. Flight Timebuilder owns the aircraft. Owner Neil Ramphal said the pilot was not checked out to fly the airplane by herself, that she was supposed to fly with an instructor. Donald Trump, no stranger to noisy publicity, is complaining again about the roar of jets in a $100 million lawsuit over air traffic he says is purposely being directed to fly over his ritzy Palm Beach club. "I am saving one of the great houses of this country and one of its greatest landmarks," he said in an interview Monday, "and it's being badly damaged by the airplanes." Rather than fanning air traffic in multiple directions, Trump says the county's airports director — who has been named in prior litigation filed by the real estate mogul — has successfully pressured the Federal Aviation Administration to have controllers direct almost all flights due east, directly above Mar-a-Lago, the lawsuit claims. It calls the actions "deliberate and malicious." Noise, vibrations and emissions from the planes are causing cracks and other damage to porous stone construction, antique Spanish tiles, roofing, floors and columns, not to mention disrupting "the once serene and tranquil ambience," the lawsuit says. "It's doing tremendous damage to the No. 1 landmark in the state of Florida, between the vibration, the soot, the noise, all of these elements," Trump said. The County Attorney's Office said it hadn't been served with the lawsuit and had no comment. The Mediterranean-style Mar-a-Lago, completed in 1927, is a National Historic Landmark. Trump bought it in 1985 and after extensive restoration, opened it 10 years later as a private club. About 450 of the island's elite are members. "There's no place in the world like it — it's one of the great places in the world," Trump said. "And I have to protect it. I have to protect it." Heywood, a teacher and audio/visual media specialist at St. Croix Career and Technical Educational Center, is getting students involved in aviation classes and clubs. Heywood says there are a lot of great careers in aviation. With her help the students are earning scholarships, getting college credits and getting into good aeronautical universities. “My heart is in it to do things for kids,” Heywood said. Heywood collaborated with the Department of Education in getting the Aviation Academy at CTEC off the ground this school year. The students enrolled in the academy earn 12 to 21 hours of college credit that can be used toward aviation science and engineering. The students will take the Federal Aviation Administration entry level aviation mechanic technician exam, and they will be able to get their private pilot's license. Heywood said the students will be well prepared for a future in aviation. To enroll in the program, students must be members of the V.I. Chapter Tuskegee Airmen Inc. Youth Aviation Club, Heywood said. Heywood said the club enhances the students' learning experience, providing opportunities to attend flying camps in the summer at aviation programs across the country. The organization exposes the students to hundreds of careers in aviation, and they meet people working in aviation. It gives members the chance to attend annual Tuskegee Airmen and Organization of Black Aerospace Professionals conventions. “We tell the students they are ambassadors of the Virgin Islands,” Heywood said. There are 60 members, age 8 to 18. And all the members earn community service hours doing required volunteering in the community. Heywood, a charter member of the V.I. Chapter of the Tuskegee Airmen Inc., founded the youth organization to keep the history of the airmen alive. Local folks may know Heywood as the daughter of Tuskegee Airman Herbert H. Heywood, one of the pioneering black fighter pilots of World War II. When she was a young girl she did not realize how important her father's role in the war was. She said he was a strict man and pushed education. Her mother is Catalina Cepeda Heywood, a former Pan American Airlines employee. Heywood was born on St. Croix and moved to Brooklyn, N.Y., when she was six-years-old. She joined the Air Force immediately after graduating from high school. She said that wasn't her father's influence. Old military movies made the Air Force look fun to her. In the service she worked as an airfield management supervisor and training manager. She earned her master's degree in public administration at Troy State University and is working on a masters in curriculum assessment and technology. Heywood has instructed American Red Cross CPR and First Aid for more than 25 years. She said she and a group of people stood helpless and watched a man die, so she decided to learn CPR. Heywood is an active member of American Legion Post 102 and is often seen marching with the Legion and the youth aviation club in local parades. 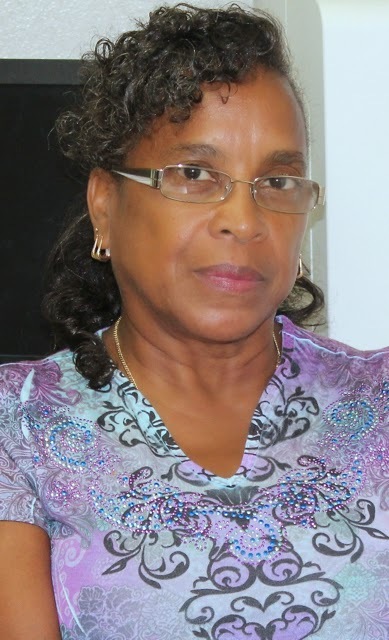 She is in her third term as second vice president of the St. Croix Federation of Teachers and a VITEMA government liaison. She has traveled the Pacific, Middle East, Central America, Europe, and the states. Heywood hopes to start a Young Eagles group with students as young as eight years old receiving their first flight and continuing their flight training towards attaining a pilot's license. She said the students would not have the opportunities they have had if it wasn't for the generosity of Bohlke International Airways. People can get more information about the youth aviation programs by sending Heywood email at viyap.stcroix@gmail.com. "A violist, a cellist and a bassist walk into an airport ... "
It feels like the premise to a corny music joke, but for working musicians traveling with their instruments, walking into an airport was no laughing matter. "It's terrifying," says Minnesota Orchestra violist Sam Bergman. "Even if if you think you know an airline's policy and you arrive at the airport having researched it, everyone's got horror stories about having missed a flight or left off a flight because a gate agent says you can't bring your instrument on the plane because it doesn't fit inside that little box they have." Recently we published a blog post that summarized a recent rule from the U.S. Department of Transportation (DOT) to implement section 304 of the FAA Modernization and Reform Act of 2012 regarding the carriage of musical instruments as carry-on or checked baggage on commercial passenger flights. In summary, the new DOT ruling states — provided all safety requirements are met — musicians are allowed to bring small instruments, like violins or guitars, on board aircraft to be stowed in an overhead bin or in-cabin storage space; to purchase a seat for larger instruments (e.g. a cello) at no additional cost beyond the typical price; and to check really large instruments (e.g. a bass) in the aircraft's cargo hold. Following the publication of the DOT rule, the American Federation of Musicians of the United States and Canada (AFM), AFL-CIO, issued a statement applauding the efforts of all involved. To get further insight into musicians' travel experiences and their thoughts on the DOT rule which becomes effective in February, we asked a violist, a cellist and a bassist to share their thoughts.